The Total Basement Finishing system has been carefully researched and designed by the best, most experienced basement finishing and waterproofing contractors in the business, ensuring that you'll have a product that can work for basement finishing of all types, while also being appropriate for the unique environment in your basement. Fitch Total Basement Finishing, your local Total Basement Finishing contractor, would like to help you transform your dark, musty basement into dry, beautiful, naturally private space. If you'd like to take the first step to taking advantage of that unused floor of space in your home, call or e-mail us today! 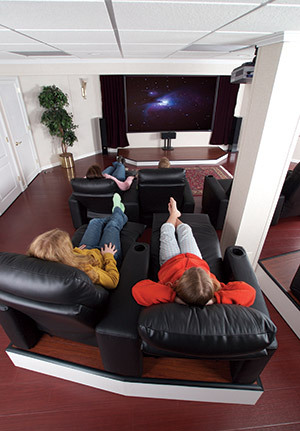 The Total Basement Finishing system is made to perfectly fit your basement environment. It's versatile enough to work with any design idea you have in mind for the space- from a family room, to a home gym, to a wine cellar and more. Your basement is a unique environment, with challenges that do not appear anywhere else in the home. But obstacles, low ceilings, utilities, and the other challenges of a basement finishing are exactly what the Total Basement Finishing system is designed to handle. We can overcome any challenge! Our free-standing basement wall panels make excellent wall partitions for building rooms in your basement and partitioning off a space for storage. High quality ceiling tiles can box out ducts and pipes, with each tile providing an access point for servicemen. We can build in basements of all types- even if your walls are made of stone or are not straight. Call us today to customize your finished basement plan with us for free. What will you do with your space? 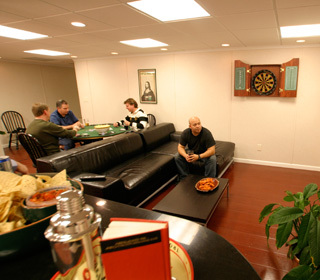 Our basement finishing products are designed to maximize the beauty of your basement and bring out its true potential. With proper lighting, quality products, and a lasting design, your basement is a blank canvas. You'll be amazed by what we can do! Drop ceilings provide a unique opportunity to blend many types of lighting options in a single basement. They're compatible with lighting of all types, including fluorescent lighting, task lighting, pendant lights, and suspended lighting. Our walls are solid enough to easily support the weight of mounted light fixtures, while our basement windows and window wells are designed to maximize natural light in your finished space. Our basement walls are designed with an appealing beige and off-white blend--two colors that will never go out of style. The vinyl surface of the wall is very durable and easy to wash--even stains from marker, pen, and paint. The distinct pattern of our wall panels helps to hide small holes from nails and tacks after being patched with a bit of putty or even toothpaste! With eight different finished floor designs, we have a waterproof flooring for every style. If our wood, parquet, tiled, and carpeted designs are not what you had in mind, we can also provide waterproof basement sub flooring, so you can install a custom carpeting. Additionally, we have a wide variety of crown molding designs, ceiling tiles, and basement wall designs that we'd like to discuss with you. With TBF, there's something for everyone! Drywall, organic materials, and fiberglass-based products are simply not up to the job in a finished basement. Total Basement Finishing basement walls, ceilings and floors are created with waterproof materials that are built to last -- with our wall panels backed by a 50 year warranty! The basement remodeling experts at Fitch Total Basement Finishing will sit down with you to thoroughly go over the plan you have for your basement project. We will offer our expertise to help you make the best decision for your home and family to create a space you will love for years to come. We provide basement finishing and remodeling solutions for homeowners in Rochester, Penfield, Henrietta, Canandaigua, Pittsford, Geneva, Batavia , Corning, Brockport, Penfield, Spencerport, Hilton , Albion, Newark, Bath, Dansville, Hornell, and the surrounding area in Greater Rochester, New York.